Image Size 24 x 36 in. Catherine Morrisey comes from a family of visual artists. She came to London from Toronto in the early 1980’s. After receiving an Honours Degree Fine Arts from York University, and continuing education at Arts’ Sake, Inc., Toronto, she earned Library Science, M.L.S. at University of Western Ontario. She has worked as a Curator, Teacher, Librarian, and Manager at London Regional Art and Historical Museum, Fanshawe College, London Public Library, Sarasota County Library, and Western Library. Select exhibitions include: Westland Gallery, “International Women’s Day, 2019, “Gallery Artists”, 2018, “Fall in Love with Art”, 2017, “Rivergarden”, 2016; Museum London, “In the Air: Canadian Plein Air Painters”, 2014-2015; The Art Exchange, “Old Willows”, 2009, “ferris & Morrisey”, 2007; McIntosh Gallery, UWO, “In Good Company”, 2006; Spencer Gallery, UWO, “View from the River”, 2004; Selby Library Gallery, Sarasota, “Florida Paintings”, 1999; Gibson Gallery, London, 1995, Group Show, and; Forest City Gallery, London, 1994 Group Show. My goal is to celebrate our local woods and river, waterlilies and willows, turtles and geese, our village. 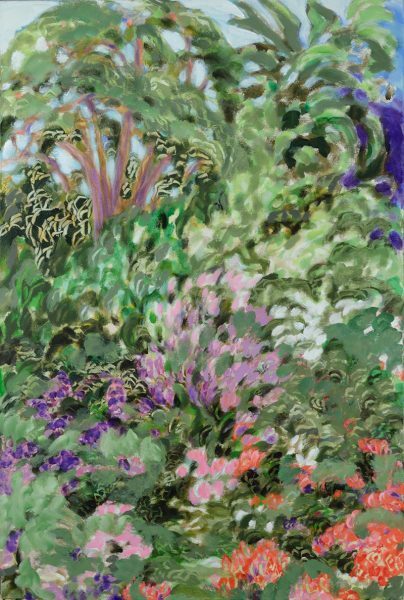 In my paintings I freely adapt traditions of Chinese painting and Bonnard’s colour methods. When I kayak on the Thames I experience timelessness and surprise, wonder and delight. These are the feelings I want to share.